DSP stands for digital sound processor. This unit may be used to adjust frequency response, phase, dead time, harmonica and many more. The DSP is a processor designed for digital signal processing, i.e. a computer that processes signals like music by means of arithmetic operators. Like passive crossovers a DSP is capable of adjusting frequency response, phase and delay. Due to the calculating power of modern processors a vast number of parameters may be adjusted. To be able to use a DSP a digital signal has to be available (like e.g. coming from a CD). Is the signal analogue an analogue-digital converter (ADC) has to be used to convert the signal into a digital signal. The digital signal available usually in 8, 16 or 24 bit (digital on/off switches) and running through 1, 16, or 24 bit signal lines may then be processed.. Afterwards the digital signal has to be converted into an analogue signal so that loudspeakers are able to reproduce it. That's done by a digital-analogue converter (DAC). to be seen on the left. The Sitronik or Audaphon DSP-modules feature 2 ADC's, one for each stereo channel. The digital processor receives, therefore, two signals (left/right) from the ADC, already digitised with 24 bit and scanned up to 96 000 times a second. The processor possesses extensive facilities to adjust the signal on all three channels. Let's assume your glass cabinet has a resonance at 8.5 kHz, then The DSP is capable of suppressing 8.5 kHz on all three channels. It's also capable of adjusting the skew of your loudspeakers - when they are not positioned the same distance from the listening position -, the phase and may boost frequencies that your loudspeakers are reproducing too softly. These three digital signals are then converted back to analogue using a DAC, for left and right channel and the subwoofer. 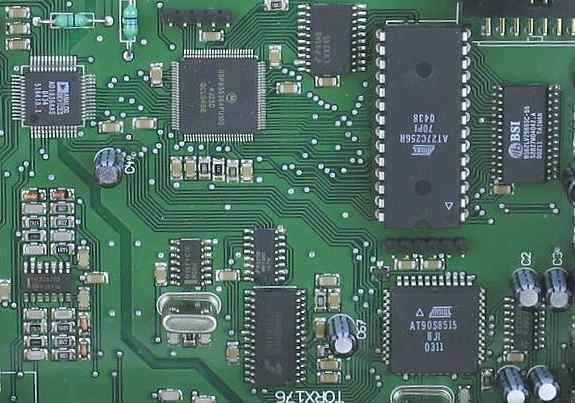 The heart of the processor can be seen in picture 3 below right: the DATA ALU (ALU = arithmetic logic unit). The remaining components are auxiliaries, programme and data memory that is extended by the way on the Sitronik PCB. There are data circuits (to the ADC and DAC), control circuits and address circuits (for addressing the external memory). Both, the ADC and the DAC are made by Analog Devices. The component AD 1836 contains all 5 necessary converters. Picture 4: Circuit diagram of the AD 1836 with 10 converters, only 5 are used; on the left in the middle are the two stereo ADC's (ADC 1L and ADC 1R) and on the right the stereo DAC's. The analogue stereo signal arrives at AIN1L and AIN1R and is then converted. The 24 bit signal is sent bit-by-bit as ASDATA 1 and ASDATA 2 (on the left, just above the middle) to the DSP. The signals coming back from the DSP are sent bit-by-bit to DSDATA 1 and DSDATA2, respectively DSDATA 3 for up to 3 stereo channels (e.g. 5+1). From here the signals are sent via volume and filters to the DAC's (on the right). The analogue signals are then available at the outputs Aout1, Aout2, ... 6. Picture 5: Detail of the Sitronik VP 300 D PCB with ADC and DAC (left above) and the DSP to the right of it.